Roast Leg of Lamb with Garlic, Thyme for Cooking elegant holiday main course. This will serve 4, or 2 with leftovers, roast potatoes accordingly, 12oz (360gr) for 2, 24oz (720gr) for 4, etc. If you have fresh rosemary, stick small sprigs in the slits with the garlic. A very general rule is 25 minutes cooking time per pound. Lamb temperature should be about 95F (35C) when you add the potatoes. Peel and cut garlic into slivers, 15 - 20 in all. Make slits all over the lamb with the point of a sharp knife. Insert a sliver of garlic into each slit. 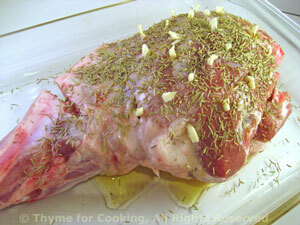 Place lamb in a roasting pan, drizzle with 1 tbs oil and sprinkle with rosemary. Insert meat thermometer, place in a preheated oven and roast, 400F (200C) for 45 minutes. Scrub new potatoes and cut in half if large (for a new potato). Toss with remaining 1 tbs oil and arrange around lamb. Pour wine over the lamb. Continue to roast until lamb is done, another 30 minutes. Lamb is rosy at 130F (54C). 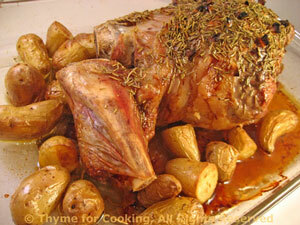 If lamb is done earlier, remove it and continue roasting potatoes for the full 30 minutes. When done, remove the lamb, cover loosely with foil and let rest 5 - 10 minutes. Spoon potatoes onto a platter. Slice some of the lamb, arrange next to the potatoes and serve.